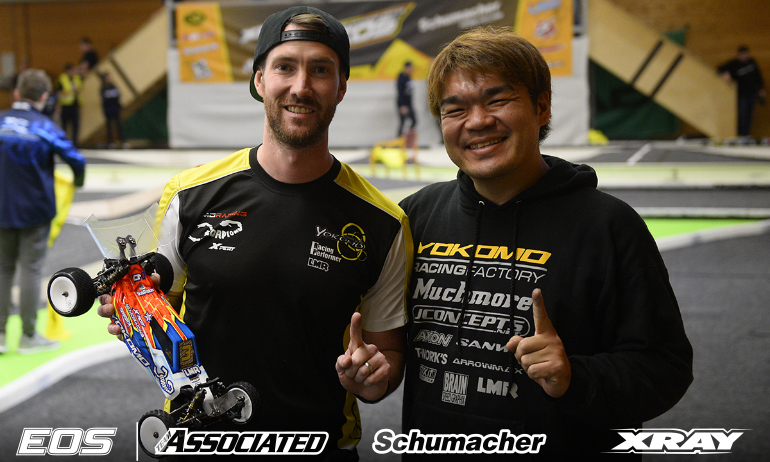 Lee Martin has claimed his first EOS 2WD win in more than 3-years, the Yokomo driver taking victory in Daun, Germany, where the outcome was decided in A3. Last winning a race in 2015 at the Hudy Arena en-route to becoming the Season #5 Champion, Martin put himself in contention for the Round 3 win when from 3rd on the grid he took the A1 win. 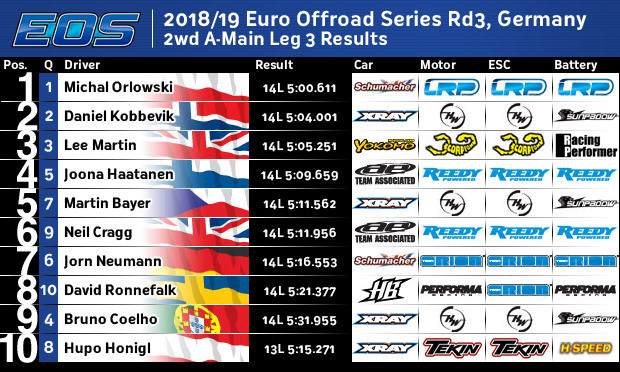 Backing that up with a P3 in A2, the British driver was able to drive a calculated A3 finishing third behind Daniel Kobbevik to beat the young Norwegian to the overall win. 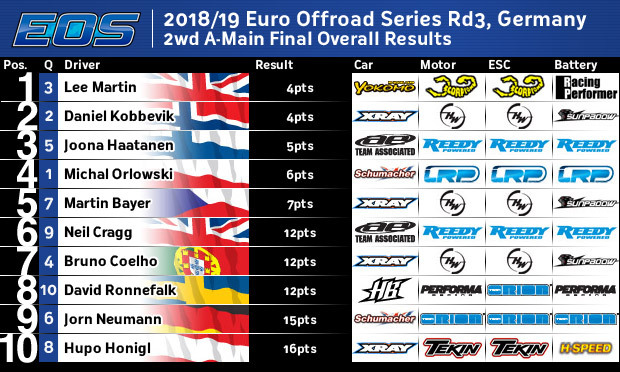 While Top Qualifier Michal Orlowski would finally pull off a win in A3, it was A2 winner Joona Haatanen who completed the podium at the record entry event but the TQ point and fourth place sees Orlowski leave Germany still tied for the championship lead – the second half of the season getting underway in 6-weeks time at the Hudy Arena. ‘I’m super happy. The car has been good enough for better results in the last few races but things just didn’t work out. It’s great to finally win again’, was how Martin summed up today’s result having gone 14 races without a victory. 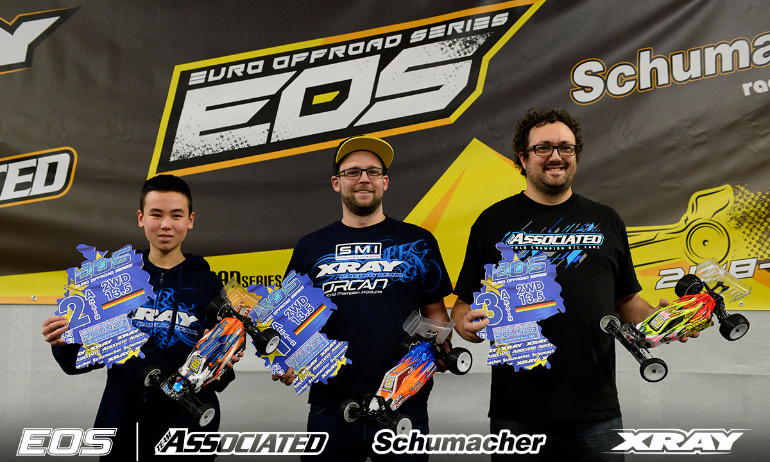 His 6th EOS career win in 2WD and now just one off the all time record held by Joern Neumann, he continued, ‘I had a tough year last year so I’m happy to start out this one better. I will try to continue like this and build on it and build up my confidence again’. On the deciding race he said, ‘I was trying to work out what was going on. I could see Orlowski was pulling away so I knew what I needed to do. Once I had a gap behind me I started to push to catch Kobbevik but I knew where I was was enough to wrap it up’. Claiming his best 2WD EOS career finish, having secured his first podium at the previous round in Poland, Kobbevik said, ‘I’m happy. We made a good showing here and I hope to build on this for the next one’. On the deciding A3 encounter, the Xray driver added, ‘I tried to catch Michal but he was too fast and I also didn’t want to risk my second place. I was happy with second’. ‘I’m happy to be on the podium. After two weeks running on dirt for the Reedy Race I wasn’t thinking I was going to finish this high’, said a pleased looking Haatanen. 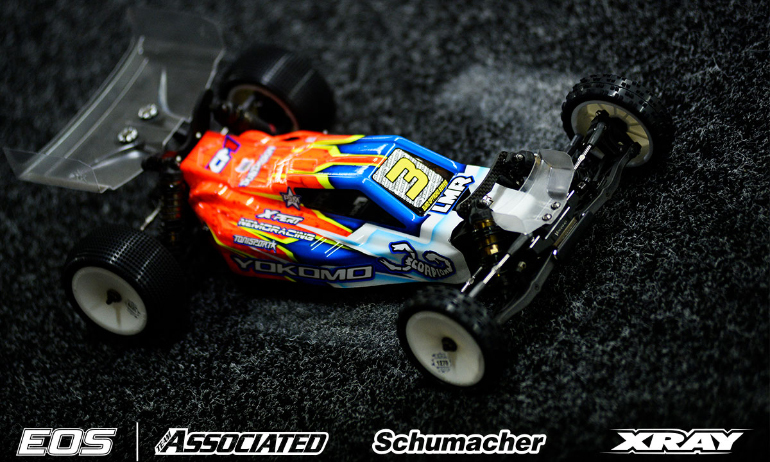 The Associated driver continued, ‘After the first two qualifiers I wasn’t even in the Top 10. I’m happy we got the car good and on the pace. A1 was my own stupid mistake and in A3 I clipped Lee’s wing and flipped over’. Entering the weekend tied on points with his good friend off the track Orlowski, the pair leave still tied with Haatanen declaring, ‘I’m happy I am still in the fight’. Commenting on his fourth place finish, Orlowski said, ‘The finals were terrible. I made some silly mistakes in the first one and then there was the contact with Daniel in the second one when we had a good lead’. The reigning back to back 2WD Champion continued, ‘I am disappointed to not get full points which would have given me a lead in the championship but I have to look at the positives. We were running a prototype car here and we were fastest so I’m looking forward to the rest of the season. I and Joona are still joint leaders of the championship. The new car is really good. 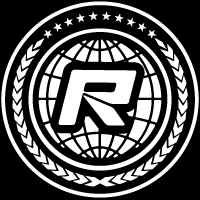 I have the best package so I hope I can pull away in the points the next round. I need to forget this one and move on’. In the 13.5 Stock class, the third round would go to Nurburgring winner Tim Kunz. 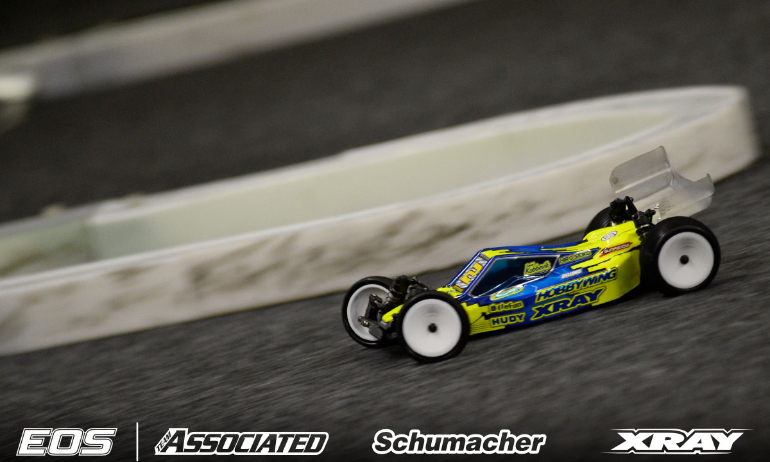 Having also taken the TQ, this is the German’s second maximum points haul of the newly introduced class. 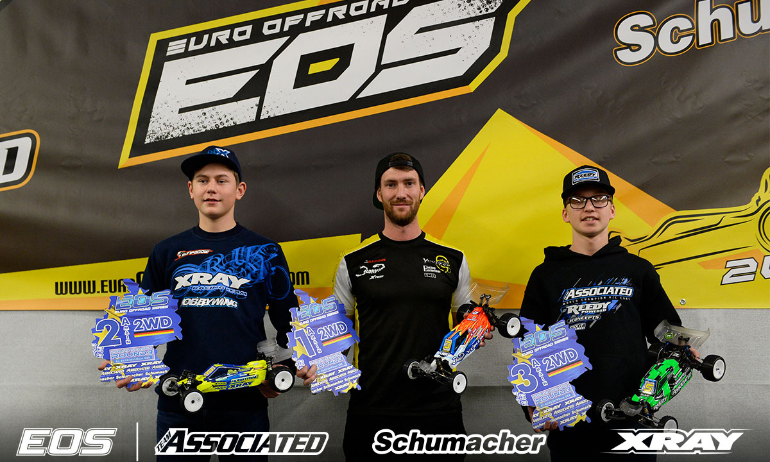 Behind him Felix Stahmer would secure second at his first EOS outing with the podium being completed by Warsaw winner Sven Rudig. In the Stadium Truck Stock class it was also the Top Qualifier Bartosz Zalewski who would would enjoy the spoils winning all three A-Mains. 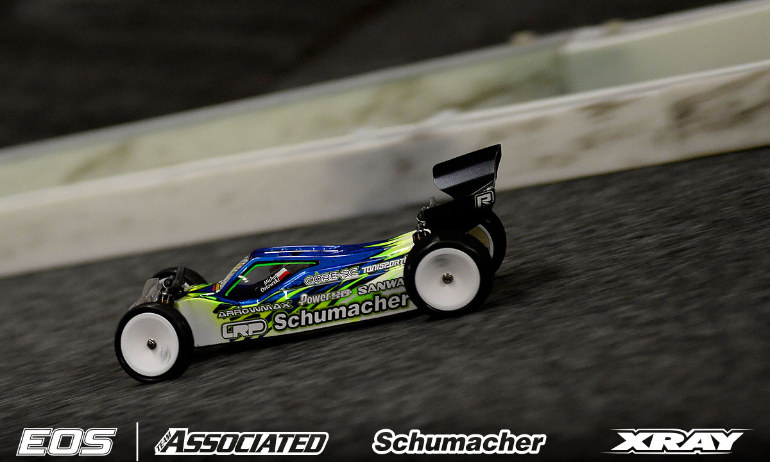 Behind the Polish driver, Jens Becker would finish second with third going to Wouter Wynen.